“Although we will not know for certain until the birds lay their eggs around the beginning of January, 2018, best indications so far are that there are 123 to 125 breeding pairs of Cahows this year,” said Senior Terrestrial Conservation Officer Jeremy Madeiros. “The entire breeding population only consisted of 17 to 18 breeding pairs when the recovery program began in the early 1960s. A pair is considered a breeding pair only if it produces an egg, whether it hatches or not. “Newly establishing pairs often ‘go through the motions’- court, build a nest together and mate – but often do not produce an egg during their first year together, and so are not considered a breeding pair for that year. 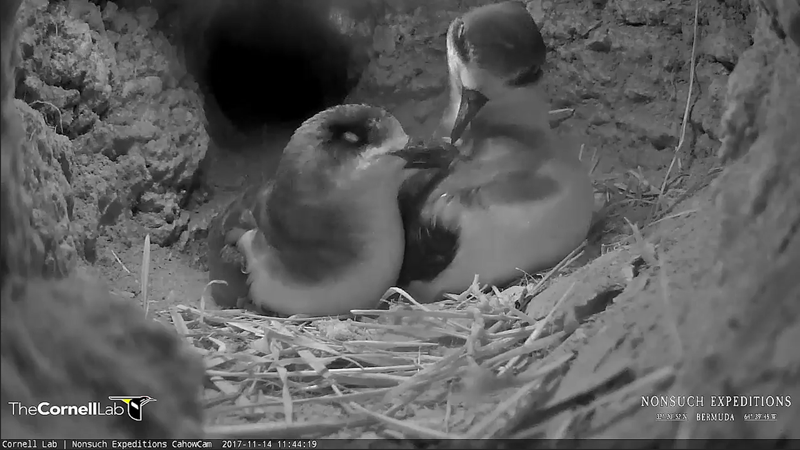 “In addition, a small number of established pairs may have successfully produced fledging chicks for several consecutive years, but then become exhausted. “Staff at the Department of Environment and Natural Resources are particularly excited to follow the progress of the first Nonsuch-produced Cahows during their first nesting season,” the Department said. “Cahows were eradicated from Nonsuch and all the larger islands of Bermuda as early as 1620, due to hunting by the early settlers and predation by introduced mammal predators, including rats, cats, dogs and pigs. Cahows were only re-introduced to Nonsuch during the period 2004-2008, when chicks were moved or translocated from nests on the four original tiny half-acre nesting islets [which are suffering increasing erosion from hurricane waves and sea-level rise]. 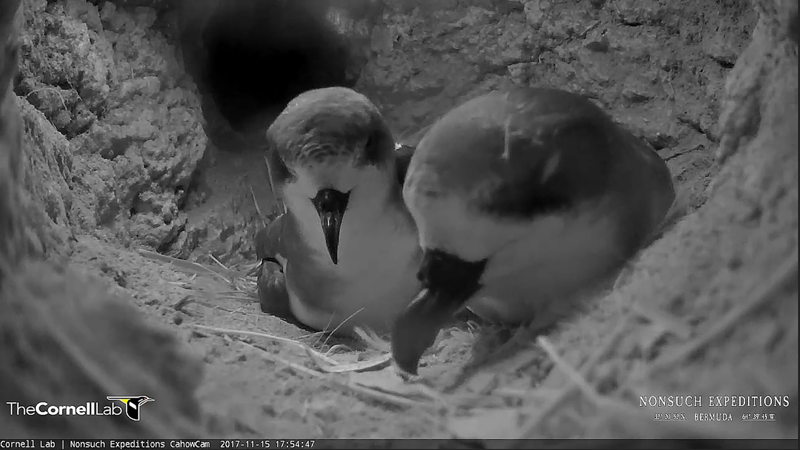 “These chicks were moved into artificial concrete burrows on Nonsuch and hand-fed on squid and fish until they fledged to sea, imprinting on Nonsuch rather than their original natal island. After spending three to five years at sea, these birds then returned to Nonsuch as young adults, paired up and started nesting in the same artificial burrows. “The first chick to hatch on Nonsuch since the 1620s fledged to sea in 2009, and this new colony has now grown to 16 breeding pairs, producing a total of 54 chicks in the last eight years. 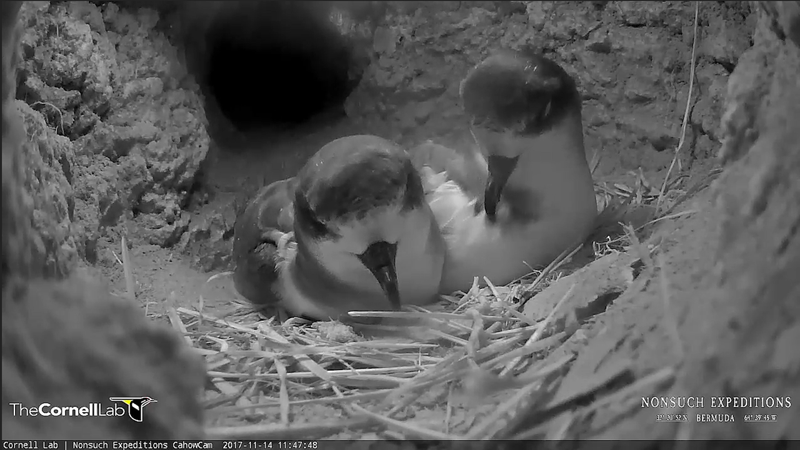 The first two of these Nonsuch-born chicks returned to Nonsuch in the 2016-2017 nesting season, and should produce their first eggs in the 2017-2018 nesting season. The Minister of Home Affairs Walton Brown said, “I would like to congratulate Jeremy Madeiros who has worked tirelessly over the years with the translocation programme to bring our national bird back from the brink of extinction expanding upon the recovery work started by Dr. David Wingate in the 1960’s. The award winning CahowCam Project was initiated between the Department of Environment and Natural Resources and J.P. Rouja of LookBermuda in 2013 to address public outreach and education, one of the objectives of the Cahow Recovery Program. Nonsuch Island is too small, isolated and sensitive to accommodate large numbers of visitors. 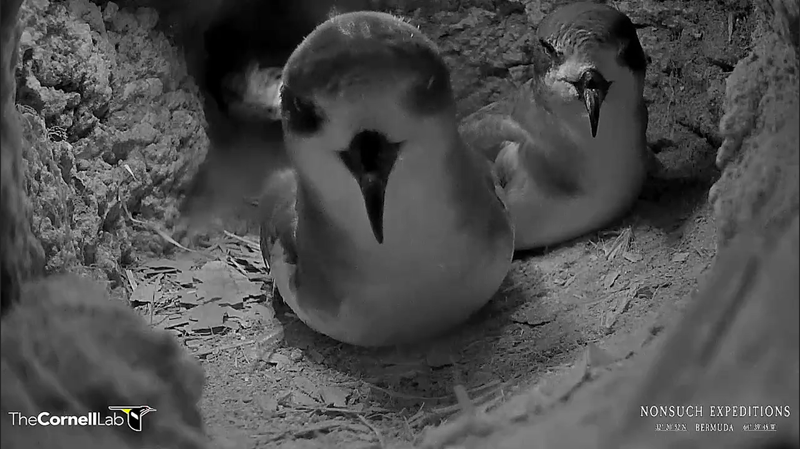 LookBermuda/Nonsuch Expeditions’ innovative CahowCam uses infra-red videography so the birds are not disturbed. 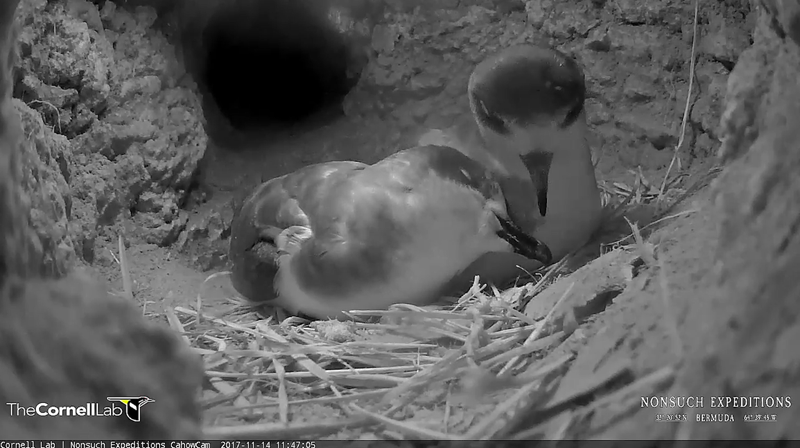 Nonsuch Expeditions Team Leader JP Rouja said, “From the technical side of this project we are now commencing our sixth season live-streaming from the underground nesting burrows on Nonsuch Island where the CahowCam continues to document never before seen behaviors. “Last season through our new partnership with the Cornell Lab of Ornithology we extended our reach to 600,000+ viewers who watched a combined 8.5 million minutes of footage!